A family vacation is the perfect opportunity to get your kids to accept culture. Where they may balk at visiting an art museum in their hometown, family travel sets a new stage for them to explore, and even welcome, new experiences in new locations. 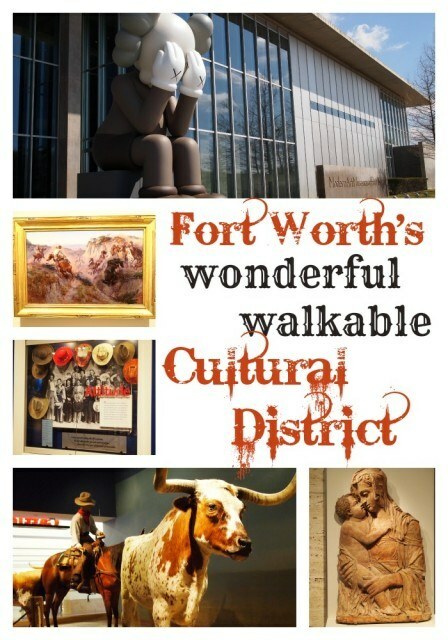 The Fort Worth Cultural District is the perfect place for families to explore art, science and history- all within a family friendly, walk-able area. Located just minutes from downtown Fort Worth, the cultural district’s tree lined streets and relaxed atmosphere are an urban oasis in one of Texas’ most vibrant cities. You’ll find plenty of parking (much of it free) and a wide variety of options- surely you’ll find something your entire family can agree on! The museums of the Fort Worth cultural district are laid out in an “L” shape; I recommend parking at one end or the other if you plan to spend a good part of your day visiting the district. With a focus on modern and contemporary art, the Modern Art Museum is certain to get your family talking. Whether you understand it or not (and I fall into the “not” category), there is something here that will catch your interest and spark your imagination. If the weather is nice, step outside the museum to the lawn overlooking the still pool to view the sculptures. And let the kids step into Vortex near the entry- it’s a terrific echo chamber. The Modern is open Tuesday-Sunday; closed holidays. The museum is free the first Sunday of every month and half price on Wednesdays. Often referred to as “America’s Best Small Museum”, the Kimball has works of art ranging from the ancient to 20th century pieces. While the collection isn’t large (or overwhelming), each piece represents the very best of that period. 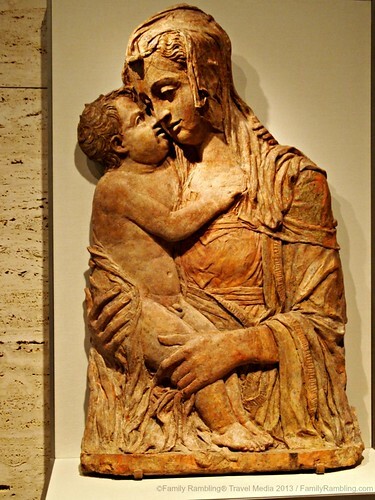 You’ll find plenty of names you know here: Picasso, Gainsborough, Monet, Rambrant, Donatello, and Michelangelo’s earliest known work (painted when he was 12 or 13). Be sure to grab a Kimball Art Museum Kids pack when you arrive- this fun packet is part guide, part scavenger hunt and part art class. It’s a great way to get your kids involved in the art they see! The Kimball also hosts films, workshops for children and adults, and family festivals. The Kimball is open Tuesday – Sunday; closed holidays. Admission to the permanent collection is always free; special exhibitions do require ticket purchase. This statement is in evidence in the museum’s research library, supporting the study of American art and history, as well as the multitude of family events and programming the museum provides- much of it at no cost. The Amon Carter Museum is open Tuesday-Sunday; closed holidays. Admission is free. Inside the Museum of Science and History is the Fort Worth Children’s Museum with plenty of hands on “educational play”. The fun outdoor water stations are especially attractive to kids. You’ll also find exhibits like DinoLab where you’ll see Texas’ official state dinosaur Energy Blast where you learn how electricity is created and the Fort Worth History Gallery which features an ever-changing series of stories from Fort Worth’s history. Be sure to venture to the second floor Cattle Raiser’s Museum to try rounding up cattle or try operating your own virtual ranch. The planetarium, IMAX theater, special exhibitions and exciting lecture series, keep this museum ‘fresh’ every time you visit. The Fort Worth Museum of Science and History is open daily; closed Christmas Eve and Christmas Day. The planetarium, IMAX theater and special exhibitions are additional cost. 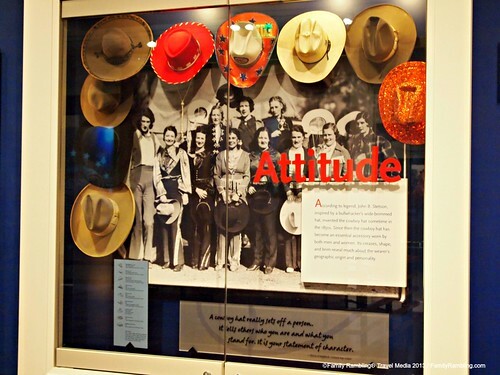 This charming museum showcases the cowgirl, an often overlooked -but vital- part of Western history. Kids will be entranced by the push-button rotating display of rodeo outfits and their opportunity to ride a bucking bronc. More hands on displays include mini-jukeboxes playing classic country western music and the theater with saddle seats. A particularly favorite display features Jessie, the sassy red-headed cowgirl from Toy Story 2 & 3. The small theater invites you to ‘sit a spell’ and enjoy a bit of Americana- on a saddle. The Cowgirl Hall of Fame features cowgirls as we picture them- think Dale Evans and Annie Oakley, but also those pioneer women who may not immediately come to mind- like the women of the Ingalls family. An incredible tribute, the “wall of fame” along the rear of the room hosts an image of every Hall of Fame inductee, while glass kiosks showcase recent entries. On an opposite wall you can search for inductees by state or last name, making it easy to learn the stories, and in some cases see video or hear audio of the women. 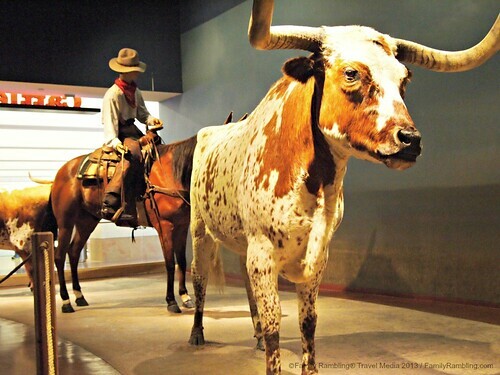 The Cowgirl Museum is open Tuesday-Sunday; closed holidays. Family travel isn’t always about exploring new places, but sometimes about exploring new ideas and experiences. 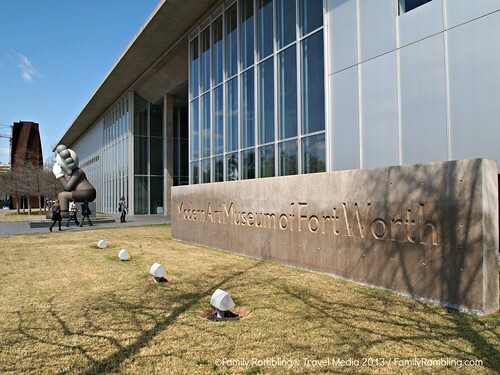 The Fort Worth Cultural District is a terrific destination to add a dose of culture and ‘sneaky education’ to your family’s vacation. 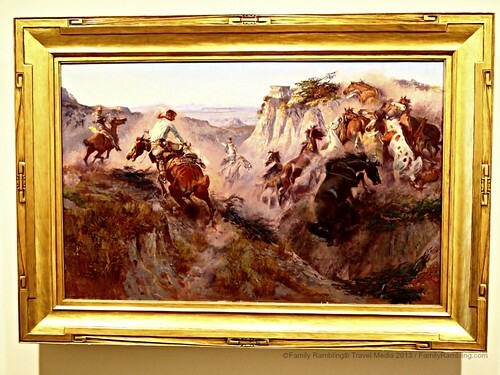 Family Rambling would like to thank Visit Fort Worth for arranging our visit to the Fort Worth Cultural District, including tickets to the Modern Art Museum and the Bernini Exhibit at the Kimball. looks like an incredible place to visit – thanks for the info! well… you know I love it there 😉 I think my fav is still the modern art museum. I just love the architecture of that building so much and the way the art is spaced out so you can really enjoy it!